I have been awarded several public art commissions through Percent for Art Schemes and Government Initiatives including Town and County Councils and The Arts Council. My public artworks include sculptures of bronze, stone, bog oak, scrap metal, steel, concrete, mosaics and murals. I aim to make accessible art that is easy to relate to and relevant to its location, often involving local community in the creative process. Relevant experience: project management, community development, group co-ordination, working to commission and budget. Public and Private Commissions are welcome! Commissioned under the percent for art scheme, by LMETB for Colaiste na Hinse Leytown Co. Meath with each horse representing a different word from the School Motto. Made from an assembly of bog woods, oak, yew and pine some of which could be over 4000 years old. The semi fossilised wood is revealed from the bogs of Tipperary during land clearance and turf cutting. There are many processes involved in converting it into workable pieces while keeping the natural twists of root and grain. The work is elemental, outdoors in all conditions and using fire, wind and water as tools. Every piece is carefully chosen and fitted by hand. 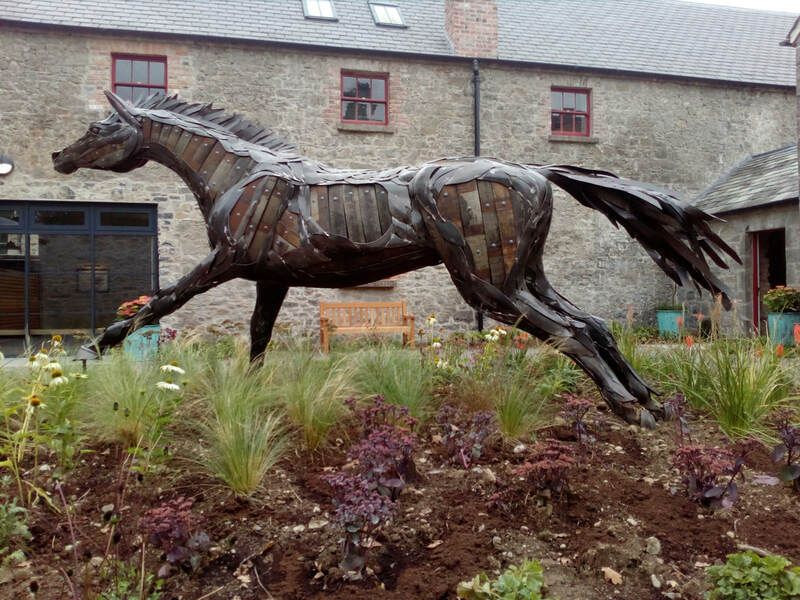 The horse forms are constructed using welded steel frames and brackets which are galvanised and painted. All the wood had to be removed from the sculptures for this process and was hand finished to protect it from the sea air. The 500 individual pieces were photographed, labelled, numbered and reconstructed before siting the sculpture. Commissioned by Slane Whiskey Distillery. Made from old whiskey barrels and steel. Made of galvanized steel and willow. Commissioned by the Wellwood Centre, Carlow Co. 2015. This is my latest public artwork, Five dairy cows made from Bog oak and galvanised steel. Commissioned by Teagasc for the roundabout at junction 14 M8 and Moorpark Farm Research Center, Fermoy. 2014.-2015. Commissioned by Kildare Co. Council for Nurney roundabout. Made from Bog Oak & steel. Year 2013. A community public sculpture involving residents of Kenmare and celebrating 150 years of the Kenmare lace tradition. Commissioned by Kerry County Council in year 2012. "Brigid of Kildare" at Sciol Bhride National School, Athgarvan, County Kildare. Year 2011. Commissioned by Kildare Co. Council for Balymany roundabout, Kildare Co. Year 2010. Community bronze commissioned by Thurles Town Council at Gortataggart Housing Development. The sculpture was made with full participation from residents of Gortataggart in 2009.